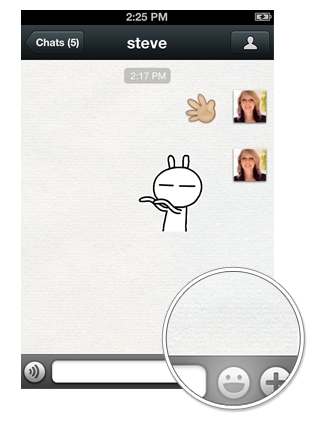 Wechat is a mobile voice messaging, phone text service which has been developed by Tencent in China. It is an app which is available across most platforms including IPhone, Android and BlackBerry. WeChat provides multimedia communication including text messaging, voice messaging, photo/video sharing, contact info exchange and location sharing. It is quite similar to some of its more known competitors like “whatsapp” but has some features that makes Wechat unique and different. WeChat gathers all of your sharing and communication tools in one place as well as has different features which makes it better than the rest! Emoticons are the perfect way to express your mood and WeChat goes a step further as you can take any image of your choice and convert it into a emoticon, save and the send it to your friends. Wechat unlike its competitors allows you to integrate via social networks and also link to your Facebook profile too. As well as being able to share images and video files easily you can also share with people around the world in a special feature called “Moments”. Wechat is not restricted to your network of friends but also allows you to communicate with the people that are around you. The feature is called “look around” and allows you to look at active users in a particular area and connect. WeChat also supports social networking and lets you connect via Facebook allowing you to see not just contacts in your phone book but also Facebook friends that are o WeChat. WeChat is set to be the next biggest app that everyone will have on their phone as a new and exciting way of connecting with friends!